Amazing Majestic Natural Wonders Not to be Missed! The topography of modern Costa Rica came from a volcanic movement that took place over 75 million years ago! Resting on the edge of the Pacific rim’s Ring of Fire, Costa Rica has some of the world’s most magnificent active volcanoes. Additionally, there are over 120 volcanic sites throughout the country! Most of Costa Rica’s volcanoes have become national parks or protected areas. The enormous craters of these extraordinary natural wonders are amazing. Their sulfurous lakes, occasional lava streams and thermal springs offer many opportunities to enjoy your Costa Rican vacation. The enormous volcanic craters that are located in Costa Rica’s mountain ranges provide a wide array of exciting activities. Go on canopy tours, waterfall rappelling or horseback riding. Give the therapeutic hot springs and mud a try as well. National park reserves, protected areas, water parks, sky trams, zip line canopy tracks, hanging bridges, wildlife sanctuaries, world-class spas, and retreats are other great activities which for your vacation in Costa Rica. Accommodations for every taste and budget are available as well. The options range from sophisticated 5-star resorts to treehouse lodges and jungle camps. Costa Rica’s volcanoes are astounding! Furthermore, they are easily accessible, making it practical to travel to these steamy giants. Poas, Irazu, Turrialba, Rincon de la Vieja, and Arenal are the most beloved volcanoes in Costa Rica. Arenal is currently dormant but still a magnificent sight to behold and one of the most popular tourist destinations because of the numerous tours and activities available. One of the best activities is to enjoy the amazing natural thermal hot springs at spas, resorts, and water parks! 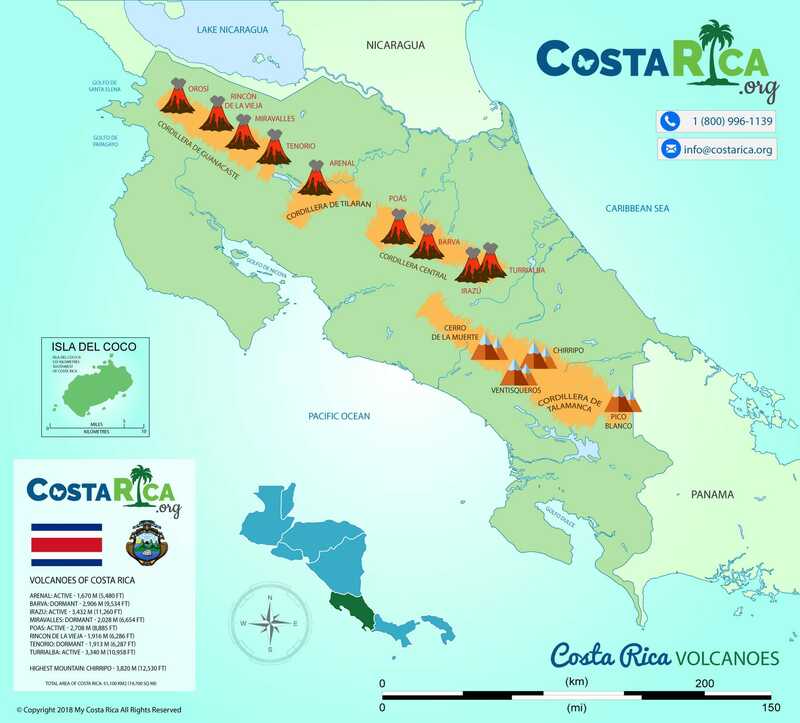 This Costa Rica volcano map also shows the seven most popularly visited Volcanoes and Volcano National Parks. Each Volcano National Park is extraordinary, as each volcano has its unique character, environment, flora and fauna, tourist attractions and micro-climates! Whatever you are planning to do there, the Volcanoes will amaze you. Arenal is one of the most beautiful volcanoes on Earth. Known for its imposing height, lush flora, great weather, myriad activities and tours to entertainment and delight. The Arenal Volcano is considered to be one of the most beautiful volcanoes in Central America. Until 1968, the Arenal Volcano was said to be dormant. The eruptions have been recorded to have stopped since October 2010. The Arenal Volcano National Park has been the number one go-to place in Costa Rica. 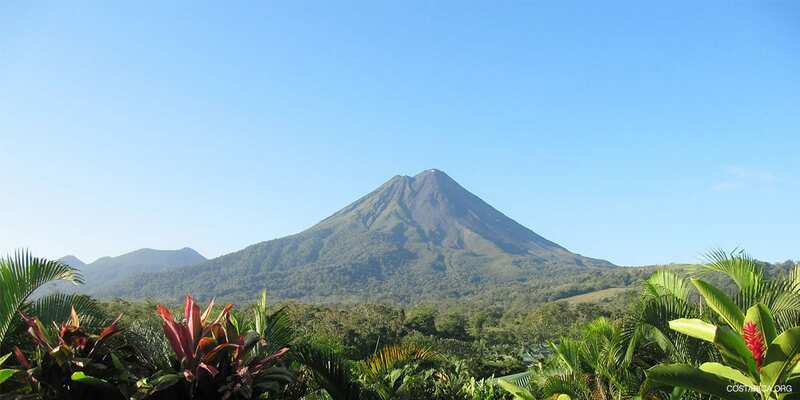 Moreover, Arenal is one of the most famous destinations for visitors from all over the world. Even locals enjoy the natural beauty, the Arenal hot springs, hiking, canyoning, kayaking on Lake Arenal and zip lining through the Arenal Volcano National Park. Barva is a complex volcano in Central Costa Rica, only 22 kilometers North of San José. It has a lagoon which was a volcanic crater before. There are three hills on top which are visible from the Central Valley. The hills are locally known as Las Tres Marías. Barva last erupted about 8,000 years ago and is considered dormant now. There have been reports about eruptions in the last centuries but investigations could not confirm that. Barva is an overlooked destination in Costa Rica which might make it interesting for you. If you are looking for a challenging hike in a tranquil forest far away from the crowds, Barva is just exactly what you are looking for. The Chato Volcano also is known as Cerro Chato. It isn’t the most well-known volcano but certainly a cool addition to the list. The Chato volcano is inactive and it is southeast of the nearby Arenal Volcano. The volcano last erupted about 3,500 years ago. One of the lava spills created the route to the famous and beautiful La Fortuna Waterfall. The hill has two peaks and a lagoon filled with green water. If you are adventurous you can hike up to the crater and the lagoon. The hike is very steep and takes about four hours. It is even more treacherous when it rains because the path becomes very muddy. Consequently, it is only advised to hike Chato when you are in good physical condition and when the weather is good. A major eruption of the Irazu Volcano in 1723 completely destroyed the capital at the time and the current Costa Rican capital of San Jose, was completely covered in heavy soot and ash after a 1993 eruption. Located less than sixty miles from the capital of San Jose, the Irazu Volcano makes for a perfect day trip with so much to see! The volcano has many fascinating and active craters, including one with a spectacular lake with beautiful dark green water. The lake can even transform colors, often between emerald-green and crimson-red. Irazu is the tallest volcano in Costa Rica, reaching around 11, 260 ft (3, 432 m). The national park is almost 6000 acres and is full of wildlife and interesting plants to see. There are so many options for food, drinks, picnic locations and excellent hiking trails in the park! The Miravalles Volcano (an andesitic stratovolcano) is found in Northern Costa Rica. Formed between 1.5 and 0.6 million years ago thanks to many explosive eruptions, it is the highest mountain in the Guanacaste Province at 2,023 m (6,653 ft). Thanks to its high heat flows, Miravalles has the largest geothermal field in Costa Rica. Orosí is located in the Cordillera de Guanacaste close to the border with Nicaragua. It is the most northwestern volcano in the country. Orosí is one of the lesser known volcanoes in Costa Rica because it is rather small and inactive. However, the area around the volcano is especially popular among ecologically minded tourists. The volcano lies directly in the Guanacaste National Park, surrounded by an wet-dry transition forest with many animals. The Poas National Park has an amazing bird population and many fascinating animals to view while visiting. Poas is one of the most visited Costa Rica Volcanoes. This has a lot to do with the proximity to the capital city of San José. The beautiful and dense forest national park that surrounds the volcano makes it a perfect escape close to the city. In fact, this modern volcano is considered one of the largest active craters in the world. It measures over 900 feet deep and a mile wide. Two crater lakes have formed near the top of the Poas volcano. One of which is thought to be the only lake in the world made up of molten sulfur. Poas Volcano gives you the rare opportunity to drive up to the rim of the volcano. Enjoy beautiful views of the volcano, countryside, lakes and the spectacular forest around you. This natural wonder is a nature lover’s paradise and makes an excellent day trip from the beaches of Tamarindo, Conchal and other destinations in the Gulf of Papagayo. Rincon de la Vieja Volcano is located in the famous province of Guanacaste, where a combination of four volcanoes (the Santa Maria, Orosi and Miravalles are the other three) form four of Costa Rica’s most amazing natural parks. It is also considered one of the most exciting volcanoes in the country because of some unusual characteristics. For example the sulfurous lagoons, relaxing mud springs, fumaroles and all the incredible wildlife surrounding it. Of course, the central active crater is a fascinating part of the volcano, with eight other volcanic points over the 250 square mile area. The famous volcano is located only an hour away from the airport of Liberia. This makes for a perfect day trip from the beaches of the Gulf of Papagayo. The whole area of Tenorio Volcano is composed of magnificent waterfalls and lagoons, small geysers and hot springs. Over the hills are magical cloud forests while the rain forest are found lower down. The must-see is Rio Celeste, well-known for its beautiful color. The Tenorio Volcano National Park, is part of the Area of Conservation of Arenal. It was opened 1995 which makes it one of the youngest national parks in Costa Rica. Three well-defined craters at the top of the volcano often display fumarolic activity. The entire volcano area consists of beautiful waterfalls, lagoons, and hot springs to explore while in the area. While visiting the national park of Tenorio, you will be able to find various species of wildlife, including monkeys, countless species of birds, insects and many fascinating plants around you. The main attraction of the Tenorio Volcano is the spectacular Rio Celeste (Blue River), where the combination of sulfur from the volcano and calcium carbonate turn the river water into a magical sky blue color, making Rio Celeste one of the most famous streams and waterfalls in Costa Rica. The Turrialba Volcano once dormant for 105 years awakens with possibilities for you to experience when you visit the sprawling green landscapes of this peaceful paradise! The Turrialba Volcano is located only 53km east of the capital city of San José. This also makes for an excellent day trip, even the ride there is unforgettable! Drive though the former capital city of Cartago, the Juan Vinas and its sugar plantations and the little village of Turrialba and its authentic feel and beauty with the lush rainforest mountain surrounding it. Take a look around, and you will find uncountable green hilltops with pastures of horses, cows, and wildlife roaming freely on the fertile land. Around the Turrialba Volcano, you can visit coffee plantations, sugar cane fields, cattle pastures and so much more.